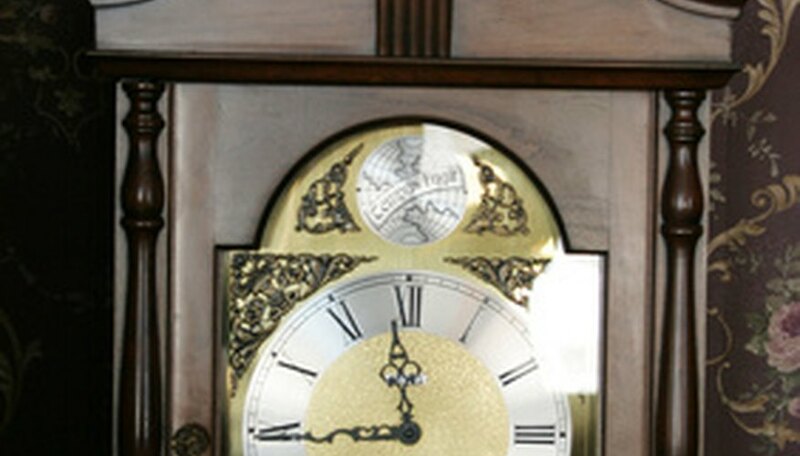 A Howard Miller clock has various mechanisms within the clock that may need to be repaired if the clock is an antique, or the clock may just need an adjustment in general. Sometimes the clock mechanisms become damaged upon moving the clock, or there may need to be an adjustment made on a faulty piece. Some antique Howard Miller clocks need to be oiled. Both antique and contemporary clocks need to be oiled once every three years as oiling keeps the mechanisms inside the clock running smoothly. Repair the moon dial if it is not working correctly. Face the clock and remove the top side panel. Open the door on the side or remove the panel from the back access section. Look inside at the back side of the dial to locate the click spring. Place your pointer finger on the tip of the click spring. Pull the spring 1/2-inch back, and then quickly release it. Watch to see if the click spring and saw tooth moon dial snap into alignment. Never force the moon dial if it doesn’t work after this adjustment. Rotate the minute hand backward 3 hours. The minute hand is the smaller hand that tells time on the clock face. Fix the clock chime if it is not chiming at the correct time. Stop the pendulum and record the time. Use small pliers to remove the small nut that holds the minute hand. Carefully turn the nut counterclockwise with the pliers while holding the minute hand with your other fingers. Remove the minute hand by grasping the point that is attached to the shaft and pull the hand forward and off. Turn the clock dial forward or backward to chime at the correct time. Reattach the minute hand and tighten the small nut without over-tightening to secure the minute hand back in place. Start the pendulum by pushing it either left or right. Reset the time. Move just the minute hand backward. Move the hour hand forward to fix the time the clock strikes hourly if it is not striking on the correct hour. Move the minute hand again only to reset the time, and then move that hand backward. Check to see if the lever on the clock is halfway between two chime melodies if the clock fails to chime or strike. If the clock doesn’t chime or strike, check to see that the lever is not in the “silent” position. Check to see that the clock is not in the nighttime silence mode if it fails to chime. Make sure the chime hammers are not resting on the chime rods, or striking the rods, making the chime sound “off center.” Slightly bend the chime hammers in the middle 1/8-inch apart from each rod—only if they get in the way of other mechanisms and inhibit the chime of the clock. Position weights correctly. Look at the bottom of the weights where they are labeled with their directions: left, right or center. Realign the weights if they are tangled to reset them in their proper places.